The Mission of Chethupattu, under the zealous missionary Priest, Jean Francis Darras, rightly called the Apostle of North Arcot, dates back to 1876. He was born of Mr. Francois Joseph and Marie Josephine Dowey on 16th March 1835. He was ordained on 18th June 1859 along with eight of his companions. He came to Pondicherry as a missionary; from there he came to diocese of Vellore. When he was preaching the Gospel round about Chethupattu, 12 non Christians from this place approached him with an earnest desire to enter the True fold. He went to Chethupattu and had the great happiness of baptizing not less than 1000 people. He started instructing the people untiringly and preached them the Good News of Jesus. He prepared them well for the baptism, stood by them in times of crisis and in dangers. He attended patiently and cared for thousands of children and adults dying due to various reasons He practiced penance, fasting and renunciation and prayed for the welfare of the people. Within five years, he converted 1700 people. Chethupattu was made a separate Parish on 11.3.1878. Fr. Darras had taken a vow to build a shrine in honour of Our Lady of Lourdes and built it on a hill top about 2 ½ miles away from Chethupattu. Since this Church was too small to contain the vast number of pilgrims Fr. Darras built a grand Church and dedicated it to Our Lady of Lourdes. It was blessed on 1st May 1896, by His Lordship, the Rt. Rev. Gandi. Its imposing structure with pointing towers irresistibly draws the people of all faith towards God. From his time onwards the Chetpet has become the center of devotion and pilgrimage. The legacy of Fr. Francois Darras still remains alive in the minds of the people. From then on, the feast of Our Lady of Lourdes is being celebrated during the first week of March every year. 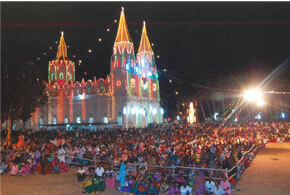 Pilgrims numbering more than 40000 flock to the Shrine of Our Lady from all parts of South India. It was in 1948 the then Parish Priest and later the Bishop of North Arcot, Rt. Rev. S. David Marianayagam, S.D.B., built the present Hill Chapel to replace the old one.Chethupattu has a population of 4000 Catholics with 21 mission stations. It can boast of two High Secondary Schools one for boys and another for girls and five Elementary Schools. Sisters of St. Anne’s Madavaram manage the Higher Secondary School for Girls. More than 2000 children receive secular, moral and religious education. Another great blessing of this Parish is the establishment of St. Thomas Hospital and Leprosy Centre. Zeaslous missionaries have enriched the mission by their activities. Rev.Frs. A. Fernandes, F. Capiaghi, M. Arockiasamy, F. Schlooz, Maria Arul, Peter Mathew, S. Susai and the Present Fr. Thomas George all have contributed their mite in the religious, social and economic up-lift of this Parish. The Centenary of the shrine of Our Lady of Lourdes was celebrated with the customary Pomp and solemnity in March 1978. The pilgrim centre of Chetpet attained a new phase when Fr. Kuriakos on 26th January 2002 started Marivalam in the hill chapel. Most Rev. Chinnappa Sdb, the then bishop of Vellore diocese, encouraged him to care for the spiritual needs of the people. People come in thousands on the full moon day to the hill chapel. Confessions are heard, prayers are conducted. Competent preachers are called to break the word of God. Fr. Octavius and Fr. John Durai took efforts to keep the momentum. It is very consoling to see people go back home with much joy and happiness after the pilgrimage. Most Rev. Dr. Soundararaju our bishop has a vision for the centre. He has already put up a structure for the retired priests. The presence of Fr. Antonyraj draws thousands of people to the shrine. People come everyday come and pray to the Lord through our beloved mother Mary. At present Rev. Dr. A. Stephen, as the parish priest, desires a new push to the development of the parish and the shrine as well.